Participants of The Good Life by LIFESPICE.in, these Indian designer labels are carving out their niches and standing tall in the intensely competitive Indian fashion milieu. The 15-year-old label Mandira Wirk is credited for giving a new expression to the classic nine yards in luxurious feminine silhouettes. Merging sublime artisanship with exquisite detailing, the brand creates outfits that may be described as wearable art. The person behind the label, Mandira Wirk, is a professional who nurtured her creativity at leading fashion schools of New Delhi and London. On offer from the label are a wide range of magnificent pieces ranging from minimalistic, flowing drapers to beautiful bridal gowns that feature fine, intricate detailing. Wirk is known for her astounding ability to transform seemingly disagreeing shades and hues into a fascinating kaleidoscope using elegant materials such as chiffons, satins, georgettes and crepes. She uses a host of colors such as soft salmon pinks, vintage golds, vivid oranges, deep blues and captivating greens. The designer constantly strives to understand couture better and has ben dressing Femina Miss India pageant participants since several years. She has also dressed famous Bollywood names like Saif Ali Khan, Malaika Arora Khan, Sonakshi Sinha, and Dia Mirza. A pupil of Rina Dhaka, Mandira’s keen interest in fashion and an innate ability of styling and design has made her label a huge success in the Indian and global market. Launched at Lakme Fashion Week, Mumbai, in 2009, Rahul N Anushka is a luxury fusion clothing label created by famous fashion designers, Rahul Anand and Anushka Lal, from New Delhi, India. Known for fusing classical design styles with global flavors, Rahul N Anushka offers luxury fusion wear in brave and appealing looks. All the attires designed by the label are a result of a strong quality base maintained by the designers to create exclusive clothing with immaculate construction lines. With clean, clear, silhouettes and an exclusive sense of style, their designs speak a global language. A vibrant design sensibility, timeless universal appeal and a unique fusion of global design trends with Indian techniques and materials make Rahul N Anushka a prominent label. The label made its international debut in 2010 at Bloomsbury Ballroom, London during Indian Premiere London Fashion Week. They opened their first ever flaghsip store in New Delhi in 2011. They also participated in the Lakme India Fashion Week in the same year and their collection was called ‘God’s New Avatar’. In 2013, the duo opened their premier range flagship store in Mumbai. A lot of famous Bollywood celebrities such as Jacqueline Fernandez, Neha Dhupia, Madhuri Dixit and Juhi Chawla have been seen in outfits by this label. Constant experimentation with her one-of-a-kind printing and needle work techniques has pushed her towards newer milestones, and moulded a unique and organic philosophy for the brand. Anupamaa’s clothes are eclectic, charming, visually stunning, in an array of vivid and unusual colours. Regularly stocked at global stores of Anthropologie, Moda In, Etre, Prestige, Ashto and Bla Bla, the label is also seen in Bombay Electric, Ogaan, Ensemble, Evoluzione, and Amethyst in India. Anand Bhushan is an Indian design brand known for fashionable and creative clothing. It has been created by Delhi-based designer, Anand Bhushan, who is an award-winning Post Graduate from the National Institute of Design, Ahmedabad, and a Graduate of National Institute of Fashion Technology, New Delhi. Although Anand has had extensive formal education in the field, it was his training and experience as a designer that have made his label successful. His deep understanding of fashion and textile’s past and insight into their likely future has sculpted his personal design technique. Thus the label Anand Bhushan is known for its creative designs that lend a contemporary, edgy take on high-class dressing. The label has been exhibiting its runway presentations and designs at the Amazon India Fashion Week, New Delhi, every season and retails from stores from all over India, Dubai, Riyadh, Kuwait, Singapore, New York and South Africa. Known for unique designs that effortlessly serve as day-wear and evening wear, 11.11 / Eleven Eleven creates sublime pieces that ensure one is never under or over dressed for any situation. 11.11/ Eleven Eleven is the pret label of the parent company CellDSGN Pvt. Ltd. The design vision and marketing initiatives are undertaken by driven entrepreneurs Shani Himanshu and Mia Morikawa, Fashion Design and Graphic Design graduates, respectively. Its flagship concept store, The Grey Garden in Hauz Khas Village, New Delhi and other select shops in Mumbai, Calcutta, Bangalore, Chennai, Pune, Ahmedabad and Hyderabad serve as the retail outlets for the label in India. The label also has a global footprint and is stocked at select locations in USA, UK, Japan, France, Australia, Egypt, Kuwait, Bahrain, Singapore and Brazil. The brand focuses on merging farmers, weavers, vegetable dyeing and block printing traditions with its roots in the luxury space. This has produced a garment line that provides the grounds for ethically sound products. Aharin India is a premier designer label from designer duo, Prasansha and Ashish, who are constantly working to bring forward the forgotten crafts and culture of India. The literal meaning of the brand is a collection of beautiful things and it clearly wishes to break down preconceived notions and boundaries to bring forward exciting cross-cultural looks. Prasansha graduated from National Institute of Fashion Design in 2007 with the Most Creative Design Collection Award. Her designs have been printed in the Kingfisher Calendar. She has also won the VIP Feelings Lace and Lingerie award and was among the finalists at Will Lifestyle debut. 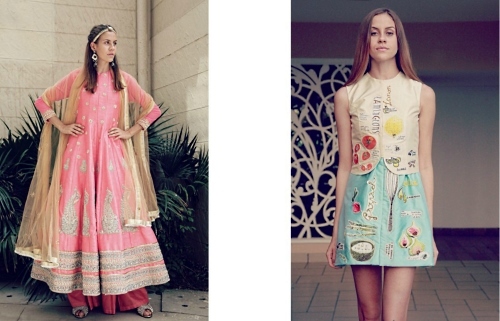 Prasansha has worked closely with international designer Sandy Starkman, one of the founders of NIFT in India. Tagged celebrity fashion, Indian designers, Know the Designer, LifeSpice, Sartorial Notes, The Good Life Luxury Exhibition. Bookmark the permalink.